Living Space: 4099 sq. ft.
A central home area featuring a luxury covered patio, custom island kitchen with bar and bar-stools, central dining table, living room and a separate media room that could be converted to an office or main floor master suit. Upstairs is an incredible master suite with private balcony and a third floor viewing loft/painting area. Off the main house covered walkways lead you to three individual, private villas each with AC, private bathrooms and high-pitched roofs. 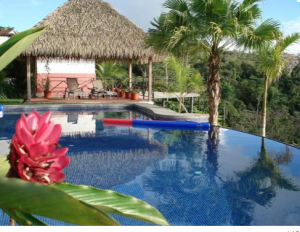 There is also a spectacular tiled infinity pool and hot tub and other covered patios and multiple bodegas for the laundry, wood shop and storage. There is also a Guard house and covered parking Rancho. There are lots of extras with this pristine home such as cement driveway, elegant, synthetic Palmex thatch room accents, and high-end appliances, cabinets, dry storage and a large heated closet. The location is in Ojochal and is easily accessible by 2WD, yet still offers a stunning ocean/valley view from the exquisite infinity pool, looking over jungle and expansive ocean view. The property is fenced and begins at the gated driveway and leads up to the parking area.